The building in this shot was the factory for the BC Powder Headache remedy from 1928 until 1972 when BC Powder manufacturing left Durham, NC for Memphis, TN. The building was initially taken over by a bank until the early 1990s when an educational testing company took over the building. The educational testing company also renovated the former Imperial Tobacco Building. The Imperial Building was used for purchasing and warehouse uses by Imperial Tobacco of Great Britain from 1915 until 1962. In 1987 the film crew for the movie Bull Durham leased space in the Imperial Building for production offices and locker room scenes. In the 200s the educational testing company bought the Imperial Building and renovated it for additional office space. That same company also bought the Brodie Duke Warehouse (built in 1878 for a tobacco warehouse which closed in 1963 and was renovated in 2000 for office space). I've shown all of these buildings in other posts but don't think I ever put all the information together. So next time I have a shot of one of the other buildings, if I remember to, I'll reference this post. Since I've gone this far, if you click on this old skywatch post the third shot is of the imperial building. Next, if you click on this old our world post the first three shots are of Brodie Duke. I guess you could say this is a good example of recycling. This building could have a starring role in a play. Quite a history. And love those puffy white clouds. 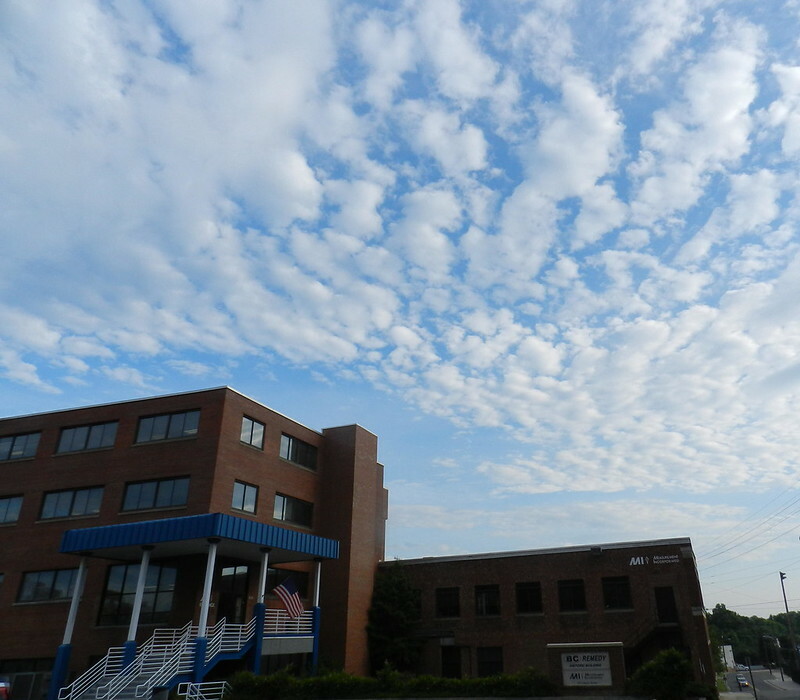 Beautiful skies for the day, Carver, as always! Great backdrop for the converted building!! Have a great weekend!! I love the clouds, and that building has quite the story behind it. Lovely shot - and it has such an interesting history too. The clouds enhance the beauty of blue of the sky. Great pic. The building with interesting story behind. Wonderful clouds! Interesting history and I love those friendly white clouds. Lovely soft, fluffy clods contrasting the sharp angles of the building. Nice shot of the building under the blue sky. fluffy white sheep in the sky ! Beautiful !